Welcome to our wonderful world of french bulldogs. We are located in Loganville,Ga. about 45 minutes north of Atlanta. We are a small hobby breeder and our fur babies live in our home. They are AKC registered with champion bloodlines. But first and foremost they are happy, healthy, companions. We are not a large breeder we only have a couple litters a year. 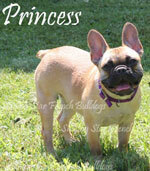 The French Bulldogs have progesterone tests (usually 3 or 4 times) when they go into season. When they are ready they are AI (artificially inseminated) at least 3 times. We do a ultra sound at 4 weeks to see if they are pregnant and if they are the babies are born by c-section. All of this is very expensive but they are so worth it. I am hoping to rehome my puppies in Georgia, Alabama, Florida, Tenn. South Carolina all southern states I don't fly them, I would prefer you pick them up.